Shares of Apple Inc. (AAPL) soared to an all-time high of $346.45 on Thursday. However, this technical feat is nothing new to AAPL, which has been creating a series of HH and HL since January 2009. Throughout this time, the equity has relied on strong support from its trendline. As AAPL continues its upward trajectory, a further capitulation by the shorters could send the shares rallying even higher (short interest stands at over 8.17 mln / 910.8 mln float). Technically speaking, AAPL has been moving largely higher over the past year, gaining 63.50% year-to-date. The security currently trades at a trailing P/E of 22.85 a forward multiple of 15.16 and a PEG ratio of 0.88. Volume of 5.4 million shares is still well below the daily average volume of 15.3 million shares. 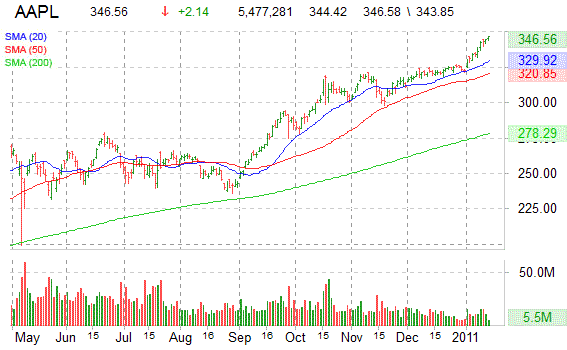 AAPL currently prints the tape above its 50-day moving average of $320.84 and above its 200-day moving average of $278.29. Look for these parameters to climb to confirm the company’s upward momentum. The median Wall Street pps target on the ticker is $387.50 and the high target is set at $500 with majority of analysts have a ‘Buy’ rating on the company’s shares. At last check, shares of AAPL were up $2.14 to $346.56, a gain of 0.52%.